BERLIN, Aug 29, 2012/ — “Fashion to the romantic woman is like music to her eyes”, commented Gabriele Strehle, Head Designer of German Maison Strenesse. 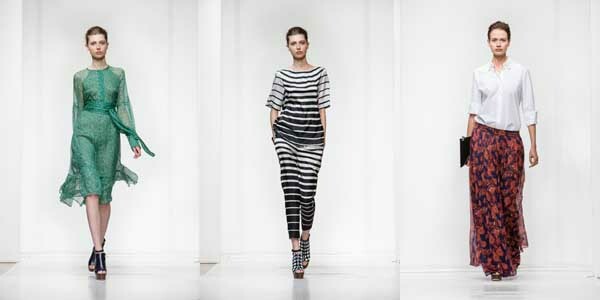 In bringing to life the subtleties and the complexities of the romantic nature, Gabriele Strehle’s Spring Summer 2013 collection focuses on abstract prints, macro stripes and black and white polka dots. While patchwork inspired prints combined with multi-layered sheer fabrics evoke complexity and sensuousness, the macro stripe motifs on clean cut cropped jackets and jumpsuits express the contradictions of the human feelings. Severe, passionate, nostalgic and volatile. The emotions of the romantic woman set the tone of the collection: whether it’s used in structured coats or light full length skirts and dresses, the cotton voile is never still. It moves graciously with the body. Different shades of emerald green, tans and light burgundies make a statement of subtle elegance. The Strenesse romantic woman is a traveler through the world of metamorphosis. And this collection is her light-as-air carry-on.